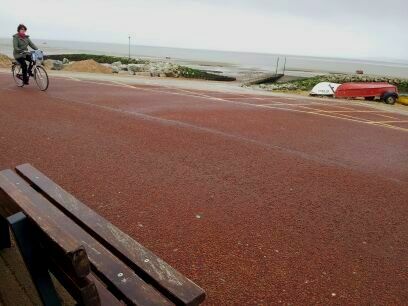 The view across Morecambe Bay is difficult to beat and is a pleasant stroll these days, following a considerable amount of work along the seafront by the Local Authority. We had a cold, brisk walk watching waders in the mud and noting the changes to Morecambe since we last came and enjoyed hot chocolate in the refurbished Midland Hotel. 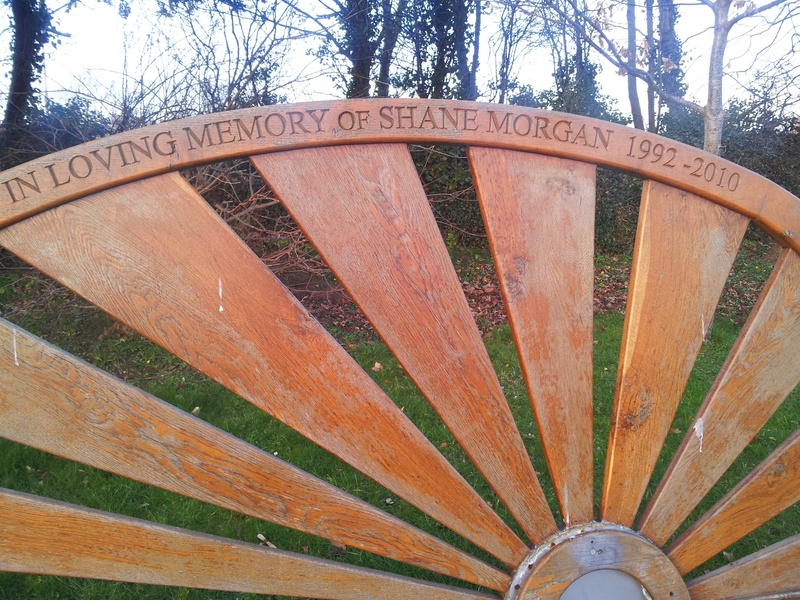 Not far from the exuberant statue of Eric Morecambe we spotted this bench with two family commemorative plaques, both giving us a snap shot of the people who are remembered here. Fiorendino Vettesse was ‘Dearly loved. A charmer to the end’. 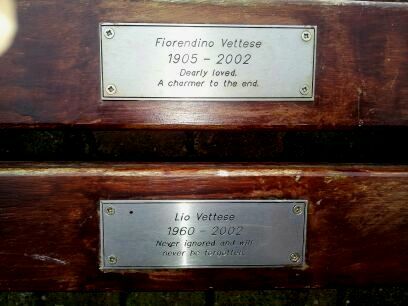 and Lio Vettese was ‘Never ignored and will never be forgotten’. Just these few words tell us that these were special people. The Visitor local newspaper, has a lovely article about Tony Vettese, Fiorendino and Maria’s son and Lio’s brother, and The Old Pier Bookshop at The Visitor ‘Doing it by the book’ . 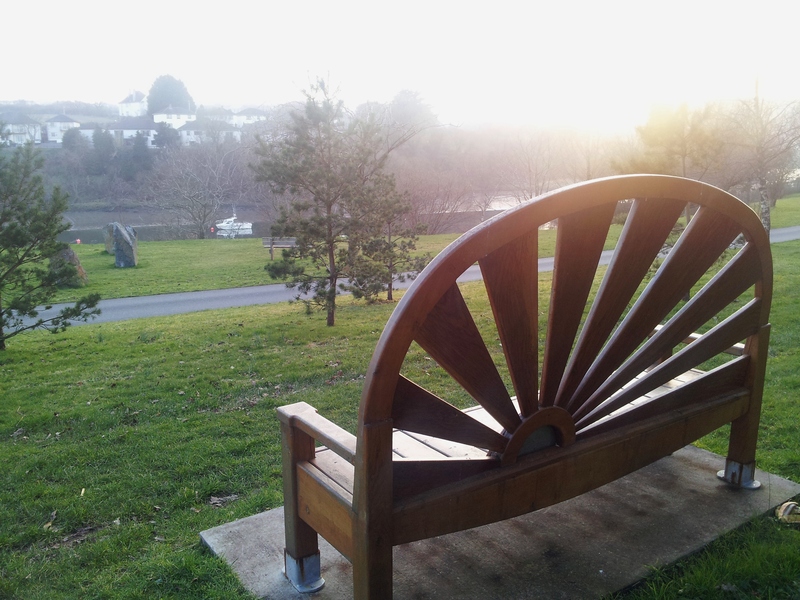 This article echoes the joy and love in the family that I sensed from this memorial bench and Tony gives some of the family history. Next time we will visit his book shop as well. Frampton Marsh is an excellent RSPB coastal wetland reserve in Lincolnshire, on the edge of the Wash.
A good memorial bench provides the passing walker with a good spot to stop and sit and this commemorative bench to Barrie Staines certainly delivers, giving anyone who uses it an uninterrupted view over one of the fresh water shallow lakes on the reserve. 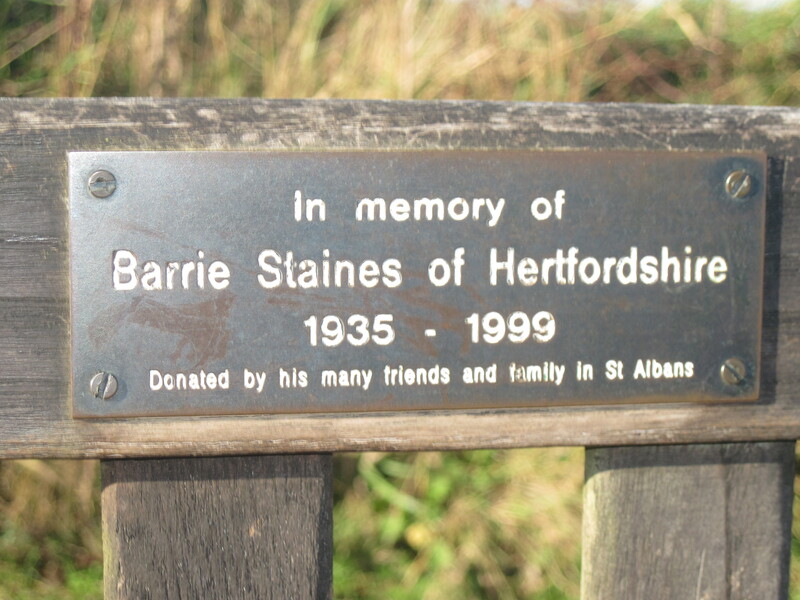 The dedication reads; ‘Barrie Staines of Hertfordshire 1935 – 1999, donated by his many friends and family in St Albans’. The passer by is left to assume that Frampton Marsh was a favourite place to visit and wonder whether Barrie Staines was a bird watcher or not. 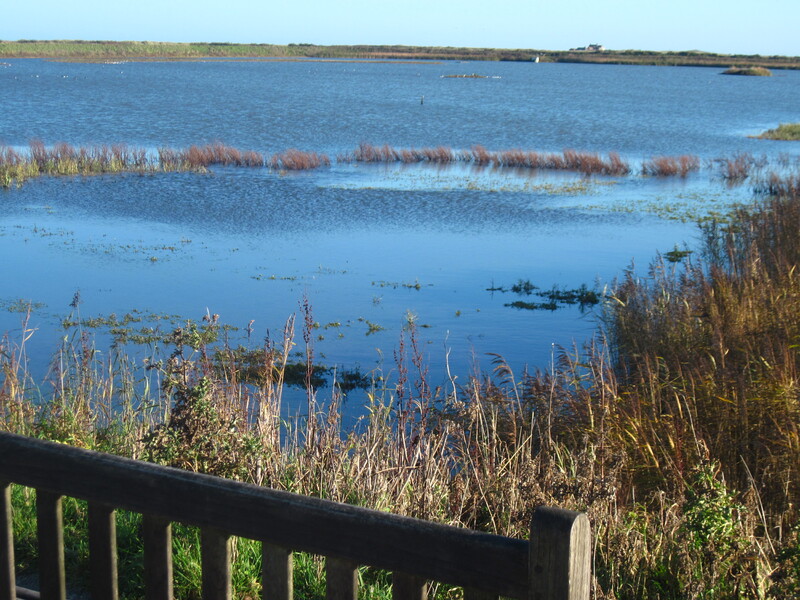 We visited Frampton Marsh on a glorious sunny day in December 2012. 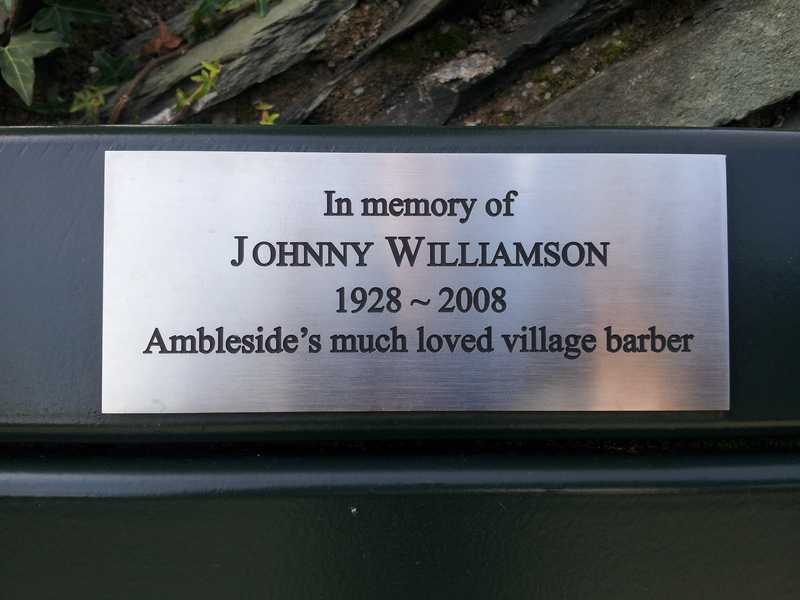 On the main road from Ambleside towards Windermere, this bench has been erected in memory of Johnny Williamson, a local barber. It is lovely when individuals are remembered by their family and friends for the person they were, but I am always interested when someone is remembered for their occupation. Johnny Williamson started work as an apprentice barber at the age of 14 and with the exception of a break for his National Service seems to have worked tirelessly until his death in 2008. 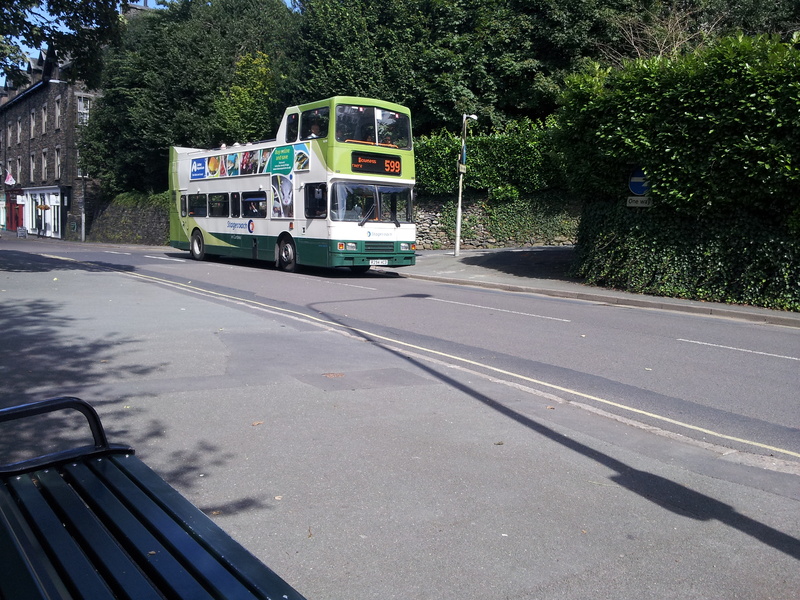 It is said he never took a holiday, would make home visits to those who were too old or ill to make it to his barbers shop on Kelsick Road in Ambleside and had a marvellous memory for names. This is a fitting and interesting commemoration of his life and work.